United Engineering has been around a long time – 93 years. They started out as a small repair shop, eventually grew to serve local industry and became heavily involved with forestry. As the economy changed so did their focus as they started working on structural steel projects. United has always distinguished themselves from the competition by being leaders in technology. In 1991 they added two state of the art machines that distinguished them from other steel and machine shops locally and abroad. 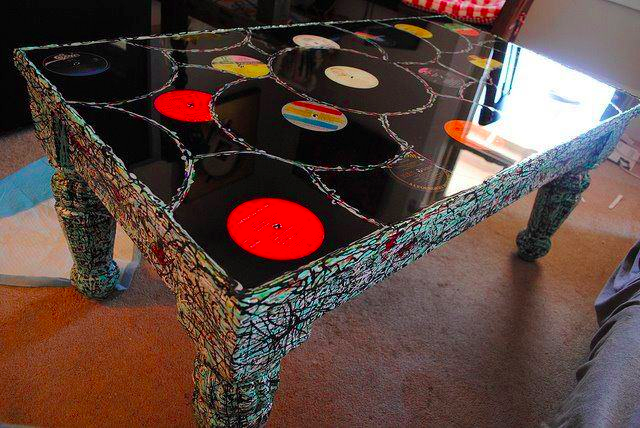 They were just getting warmed up for a major capital purchase 10 years later in 2001 when they acquired a CNC burning table and started stocking their own steel. Today Victoria based United Engineering excels in steel fabrication and machining. United does a lot of work on marine related projects (barge abutments, steel stairs, floating leads for BC Ferries) but recently they made the news for their role in helping Vancouver-based Flyzone Bodyflight become so successful. While Bodyflight is based out of Vancouver – virtually all of their manufacturing happens right here in Victoria. Their product, Flyzone, gives extreme sports enthusiasts the opportunity to experience human flight. That’s right: human flight. 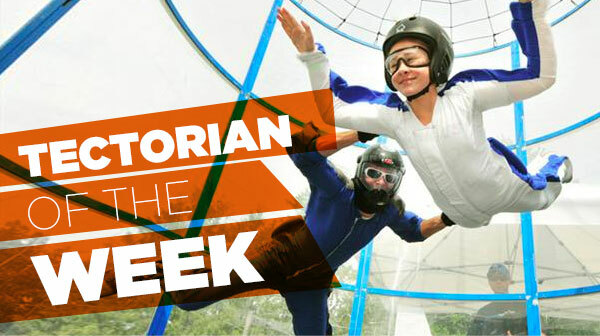 They do this by using a patented mobile vertical wind tunnel that gives a person the sensation of sky diving without the flight–or the parachute. The wind tunnels are 10 feet in diameter and channel winds of up to 200 kph that virtually lift a person off of the ground. The “Vancouver Sun” calls it “skydiving without the terror.” As you can imagine putting together this type of machinery and making it safe, is a complicated engineering problem. United Engineering currently employs 30 people in full time positions. The FlyZone project by itself involves the manufacturing of a semi stationary multi-level units that are suitable for military applications, family fun and corporate team building. These units, which can be outfitted to be open air or closed chamber, cost about $1M each with 80% of the components being sourced from Canadian suppliers. All of those components have to be assembled and fortunately, the majority of assembly happens right here in Victoria. United Engineering and other local engineering firms have been signaled out for their role in making Flyzone a success. To learn more about FlyZone BodyFlight, visit their website or Facebook page. To learn more about United Engineering check out their webpage. If you are using task or project management software you might want to consider giving Droptask a try. Free (right now) and completely visual it works very differently than your standard PM program (which are, basically, lists). The creators of Droptask, were at some point, greatly annoyed at people’s inability to clearly and easily understand what projects they were on, what was a priority and what other people were working on. At a quick glance Droptask allows you to do all of those things. It is still relatively new but they do have iOS apps available at the moment with Android support on the way. They are working on the Freemium model so a free version will always exist but a pro version is due to be released soon. Check out a full review from PC Magazine here. If you are trying to get products delivered to Asia and specifically the Chinese market logistics can be a challenge to say the least. At this round table discussion, lead by Michael Mulder FTS Environmental, we will explore join effort possibilities as well as freight and container consolidation and optimization strategies. 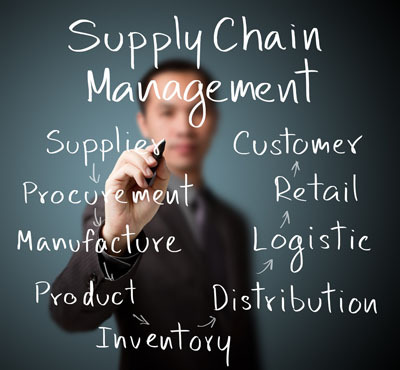 The group will also be looking to identify other professionals, willing to lead discussions, who deal with other aspects of supply chain management. As with all VIATeC hosted round table discussions this is a great opportunity to network and learn from peers who face similar challenges on a regular basis. Register here. Business development is typically top of mind for most companies. The more you focus the better it gets, so why not start the year off right with this VIATeC hosted roundtable discussion. Be part of a lively group, led by Rob Cooper (PlusROI Marketing), on Business Development, Marketing & Sales. Getting unfettered access to Rob and the rest of the group, for free, is a great way to stay on top of the latest trends and work on your own professional development. Group discussions also allow for networking and learning in a way that is only possible when you are working with your peers. Register here. This just popped up on Techcrunch a couple of days ago. The company is called ‘Zirtual’ and they provide a service whereby you can have a virtual assistant complete all sorts of tasks on your behalf. While we think the service solves a definite pain point, it is perhaps the business model of putting a SAAS shell on top of a service business that we find particularly interesting. They go to great lengths to really communicate just how focused they are on the quality of the service they are providing. Their website is clean, crisp. modern and generally leads you to believe exactly what they are saying is true. Check it out – the service may not be for you, but it is always exciting to see how another startup is strategically managing their launch. Read the full story on TechCrunch. AXYS Technologies began in 1974 with a consulting contract with Environment Canada. They were asked to conduct a study on waves that eventually resulted in several marine technology devices. From there they never stopped and eventually AXYS was designing, manufacturing, installing and servicing sensors not only across Canada but also the world. Their sensors can be found on Canada’s ‘Marine Weather Buoy Network’ as well as buoy networks in Italy, Columbia, Spain, Portugal, the United States and Brazil. HydroLevel Mini was developed to accurately measure water levels from a buoy. Recently The Chronicle Herald, out of Nova Scotia, published a story that provides a real world example of AXYS Technologies sensors saving lives and providing real economic benefits to Eastern Canada. The ‘SmartATLANTIC Herring Cove Buoy’ project was completed using AXYS sensors designed to tell, among other things, if a storm is approaching. For harbour pilots, who themselves assist other ships in dangerous and congested waters, it can literally be a lifesaver. One safety concern in particular, harbour pilots getting on and off ships via rope ladder, should get much less dangerous. There are about 3,000 such transfers per year which typically result in at least one fatality per season. This project has been a 10 year undertaking, involves a network of buoys, associated AXYS sensors, a website and of course the many dedicated professionals in the Nova Scotia marine industry. The project is projected to save taxpayers $2.6M per year due to less ocean related accidents and fatalities. Arctic Lake Monitoring System deployed in Noell Lake to collect data year-round. AXYS also just finished filling an order for an Oceanographic Ocean Institute in Ecuador. News like this, after 40 years in business, is actually starting to become common place. They continue to push, developing new products, markets and revenue streams. Many people outside of VIATeC wouldn’t even know this company, based out of Sidney, even exists. Yet there they are, day after day, quietly getting things done on a world stage. They continue to successfully compete head to head with some of the biggest companies in the world while being an inspiration to all of us here at home. AXYS – our hats are off to you and your entire team. 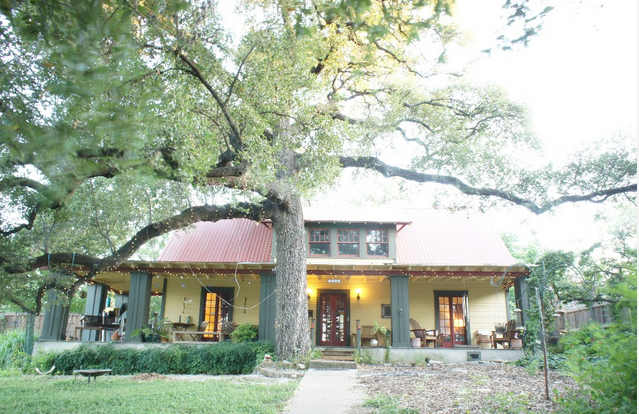 SXSW – Tectoria House is a GO! Check out the accommodations here. This past Christmas we really wanted to do something that would be memorable and put the tech community on the map. We decided to get involved in Victoria’s famed Santa Day parade. Of course simply participating wasn’t going to be enough. 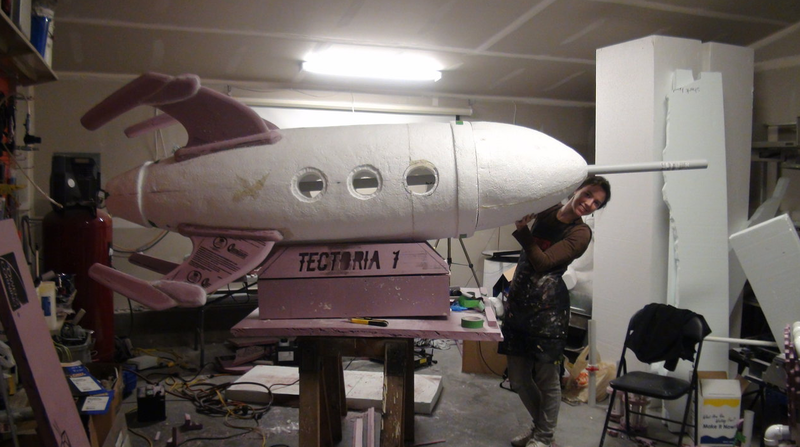 Having one of the best floats was an obvious pre-requisite of this project. Once we decided on the parade it just seemed natural that Freddy (the robot we use for our tech awards) should represent us to the community at large. At some point Dan came up with the idea of having Freddy ride a rocket which left us with one final piece to our puzzle. Who was going to bring this idea to life? Enter Ultimate Foam Creations. While we did commission UFC to create Freddy and his trusty rocket, we did so on a (very) short deadline. Freddy was ready on time and did a great job representing VIATeC to the 40,000+ people who attended the parade. While there were some amazing floats there – few got as many looks from kids as our giant, multi-coloured, lights flashing, steam shooting, robot riding a rocket in the back of a 61 Chevy pickup with Dan at the wheel. James Paquin and a rotating group of artists have been operating in Victoria at UFC for just over a year now. We needed their help and they came through. Their use of foam as an artistic medium allows the creation of 3-D pieces that are both lightweight, and at the same time durable, thanks to the hard coating they apply to their pieces. If you want to see more of their work (3-D signs, moveable set backgrounds, custom work trucks, etc) check out their website. If you just want to see more of Freddy go here. It’s been almost two years since VIATeC moved closer to downtown. The move has been great and allowed us to further our mission to serve as the one-stop hub that connects people, knowledge and resources to grow and promote the Greater Victoria technology sector. Having a location closer to the core increased accessibility and exposure for our membership, Accelerator clients and those who attend our many events. The move also allowed for the creation of a more open concept which helps us foster a collaborative environment for people to work and connect. 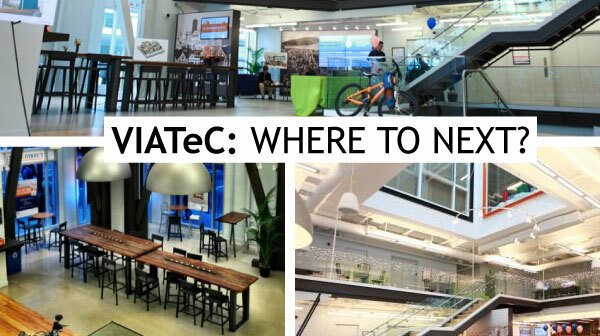 As great as our time in the Scott Building has been, VIATeC has its eye on the future. The present lease agreement runs out in one year, and now is the time to start thinking about where we want to be next. A location right in the downtown core has a lot of appeal and is something our membership has told us is a priority. The tech industry is the backbone of our economy and we want VIATeC to be at the heart of the city – bringing further exposure to our events, membership and Accelerator clients. We’ve learned that even by moving to the north end of the downtown core, our presence and top of mind awareness has increased considerably and we expect a location in the heart of the action will compound this benefit even further. We have visited a lot of tech spaces over the years and we have a vision to offer a space that offers a great gathering place for innovators and entrepreneurs. A place where people can drop in and use meeting or event spaces, a place where you can get a cup of coffee or maybe even a glass of beer and set up for a day working in a space surrounded by other like-minded individuals. We have seen great benefits by offering affordable and flexible space to early stage tech companies and we would like to continue and expand this offering. While building on what has been good about being in our current location, a new location would also provide the chance to address any deficiencies that have become apparent. Ground floor access and street front signage would improve our visibility within the city. A larger, permanent event space would enable more gatherings promoting the work being done by member businesses. This is a very exciting time to be a part of the VIATeC community. We have the chance to grow and create a permanent place to call our own. A place to connect with each other and to the rest of the world. There are important decisions to be made. The board and VIATeC management are focused on making the best choice for our future and everything from long term leases to a building purchase is on the table. We’ll share more details as soon as we have them. 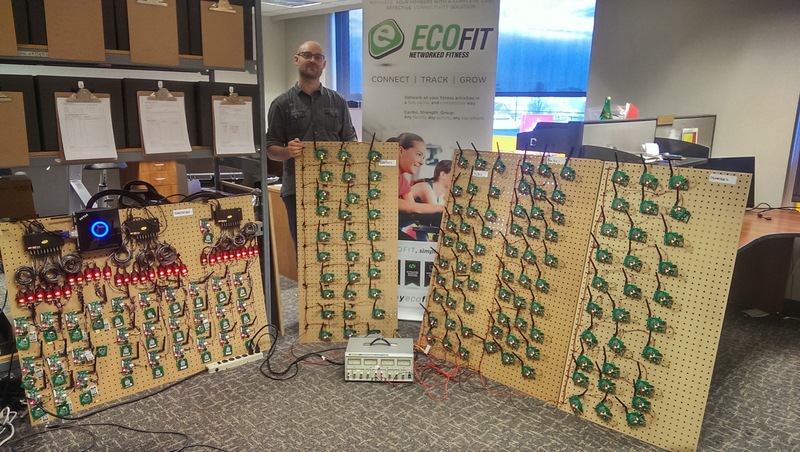 Eco-Fit was one of the first Start-Ups to enter our accelerator program.. They build a custom hardware and software solution that is sold all over the world and employ people right here in Victoria. Their modules combine with the cardio fitness equipment at your local gym to make your workouts fun, social and competitive with people across the globe. Their first major hurdle was simple; how do they demonstrate that their fitness modules, which attach to things like treadmills and stationary bikes, can work on a large scale in a massive gym? The challenge – the interference caused by so many wireless transmitters & receivers all in one place operating at the same time. The solution – building a custom wireless protocol designed to eliminate the wireless interference issue. What you are seeing in the above picture is their testing boards that prove, unequivocally, that their modules operate at 100% efficiency even when in extremely close proximity to one another. All together you are looking at 149 modules, all powered and all sending and receiving data effortlessly. Admittedly the VIATeC Accelerator community wasn’t entirely pleased with this solution. We wanted to see a ‘testing facility’ with 149 pieces of exercise equipment, sauna, steam room, roman bath, massage room, etc. While we didn’t quite get what we wanted, Eco-Fit did set up a gym of sorts that is being enthusiastically used by ‘beta-testers’.